The following comments were posted on Facebook by Peter Chegwyn, not only one of the most astute men I know, but also one of the Liberal Party’s (and then the Liberal Democrats’) most highly credentialled campaign organisers and managers. So… a lost deposit in Manchester Wythenshawe, vote down from 22.3% to under 5%, BNP & Greens beaten by just 400 votes, Lib. Dem. vote just 1/3 of the Tory vote and 1/4 of the UKIP vote, all this in a seat where we polled better than the national average in both 2005 & 2010 and, in normal circumstances, could have expected to finish a respectable 2nd this time. No doubt we’ll hear the usual from the leadership… ‘This is a seat we were never going to win’ (true), ‘We wouldn’t expect to poll well here’ (untrue), ‘We’ll do better in seats we hold’ etc. etc. etc. How long before people wake up and smell the coffee? Will it take a hammering in the European & local elections in May or even then will people still stick their heads in the sand as 2015 fast approaches? Note, the Lib Dems lost their deposit having previously held more than a fifth of the vote in the seat. Their vote collapsed by more than 17%. Repeat that result across all the LD’s current seats. Go on, I dare you. I endorse entirely what Peter says, and I extrapolate it to its logical conclusion. Whether we like it or not, politics in the modern media era is increasingly “presidential” in style. 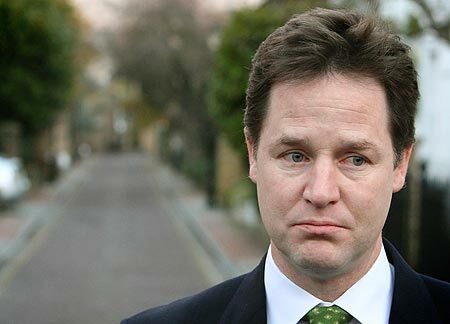 The Lib Dems leader, Nick Clegg, is now electoral poison. He is way past his use by date. If the LD’s persist with him, they will be slaughtered at not only the upcoming local Council and European elections (losing some very fine people in the process through no fault of theirs, which does no one any good, specifically the good people they represent) but at the next General Election they will be reduced to an irrelevant rump of seats – back to the dark days of the 1950s-1970s. And his credibility is not going to be helped by breaking stories like this. Anyhow, apparently, a request by 75 constituency parties for a leadership spill can trigger an election. Moves are afoot amongst seasoned party campaigners to test that possibility. Your correspondent, Dear Reader, is clear.